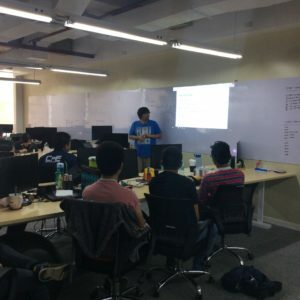 March 28, 2018, LegalMatch hosted Agile Essentials Workshop, the first in a series of monthly training-workshops planned for this year. These trainings will cover various software development topics. Twenty selected IT/Computer Science and Computer Engineering students from the University of San Carlos, University of San Jose-Recoletos, Asian College of Technology, and University of Cebu participated in the discussions facilitated by LegalMatch’s very own Project Managers/Scrum Masters, Software Architects, QA Leads, and Developers. These speakers are seniors in their respective fields, with more than 10 years of solid experience in Agile Software Development. What could be more insightful than an insider’s view of a successful agile at work?! Ryan Eballar, LegalMatch’s Front-End Architect, giving a talk on the Agile workflow. Agile Essentials, an introductory workshop on agile software development, presented a high-level overview of the key principles of agile. A lot of essential Agile principles were presented in the whole day workshop. Part of the introduction conducted by Em Galleon, one of LegalMatch’s Project Managers, were Software Development for business and the Agile vs. Waterfall comparison. These topics are crucial in introducing Agile to these young minds who may soon be practicing Agile principles in their respective careers. The key topics discussed by LegalMatch’s Developers and Project Managers were the Agile workflow from product feature to ready-to-release code, Scrum team structure and responsibilities, and the Agile key concepts – user stories and story points. The students were then asked to create a sample project after the theories. One of the highlights is the discussion on project management that involves concepts of Release Planning, Sprint Planning, Daily Planning, Sprint Tracking, and Retrospective. If there is project management involved, there should also be the roles of Developers and QA with their corresponding tools and technologies used. The students were then asked to present their projects to gauge what they have learned and their understanding in implementing agile. These students indeed proved that they are already a step closer to a career that’s geared for the future. To close the training workshop is a talk on Career Hacking from LegalMatch’s very own General Manager, Christine Rom who aims for LegalMatch Philippines to continue to partner with Cebu’s top IT Universities. This will bring about the company’s responsibility as part of Cebu’s IT community – equip students with the needed knowledge and skills, nurture them, and give them a head start in building their own successful tech careers in the near future. With today’s highly competitive IT workforce, embracing an agile mindset while in school and understanding the agile methodology early on will go a long way towards getting IT/Comp Sci/ Comp Eng students prepared for a fast-tracking career in IT whether locally or abroad. The students with their certificates after the training. 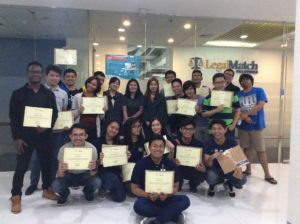 LegalMatch Philippines is planning to offer trainings to other IT schools from within the Visayas and Mindanao as well. or email us at happyteam@legalmatch.com for inquiries on our next agile workshops.